The term malabsorption covers more than 25 diseases and syndromes (L). Disorders of the digestion are responsible of some of those conditions. In pancreatic insufficiency the pancreas (L) secretes few or none of its enzymes into the gut. As a consequence, food is not broken down in particles that can be absorbed. In biliary tract disease, the absence or the reduction of bile (L) dramatically disturbs the absorption	of fat. Some rare diseases involve lesions blocking the lymphatic pathway (L). 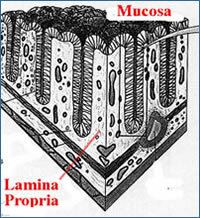 Most frequently malabsorption is caused by lesions of the intestinal mucosa cells (L) and by the lesions of the cells in the layer next to the mucosa, the cells from the lamina propria (L). In malabsorption, the higher volume of food remaining in the intestine without being absorbed causes abdominal cramps and is responsible for a larger stool mass. If the intestinal motility is maintained in people with malabsorption the larger stool mass will be divided into several bowel movements over the day and the greater volume of the stool mass is less perceived or may go unnoticed. Should some constipation be present, the larger mass of stool may be issued in one bowel movement or in one bowel movement every two day. Some abdominal pain is common and constant in malabsorption. People with malabsorption experience a little cramping before a bowel movement. Bloating and flatus will occur particularly in those patients with intestinal mucosa cell lesions. The bacterial flora sours the non absorbed carbohydrates (L) of food, producing gases, the origin of bloating and flatus. If the malabsorption is not severe and the appetite sufficient, a higher food intake may compensate in part for the lower absorption. Larger than normal stool mass, abdominal pain, bloating and flatus are the first symptoms of malabsorption. Should malabsorption endure, other symptoms will develop, related to the gravity and the duration of the various deficiencies caused by malabsorption of food and of vitamins and minerals. - Iron deficiency causes anemia in up to 20% of patients with malabsorption. Iron deficiency results in anemia by reducing the supply of hemoglobin, the oxygen transporting pigment of our red blood cells. Zinc is essential for many enzymes. The moost noticeable effect of a zinc deficiency is that you loose your taste. - Since malabsorption reduces the supply of folates (L), the resulting folate deficiency will cause abnormal growth of the red blood cells. During their maturation some of the cells will become microcytic (L) , some will become macrocytic (L) . Vitamin B12 will also be less absorbed. Vitamin B12 deficiency occurs late, where it may take up to 5 years to deplete the body store of vitamin B12. It should be noted that vitamin B12 is the only vitamin where body storage can last that long. Vitamin B group deficiency alters the function of the cells in the nervous system, causing peripheral neuropathy (L) . Furthermore deficiency of the vitamin B group and particularly a deficiency of folates associated with vitamin B12 and vitamin B6 deficiency accelerates the inflammation of the arterial wall (arteriosclerosis) responsible for heart attack and stroke. - Vitamin A deficiency induces xerophtalmia (L) and impairs the biochemistry in cells of the retina (L) causing night blindness. In malabsorption, the lesions from the mucosa cells of the intestine may be associated with protein leakage. - As a result of protein deprivation, Edema from the lower extremities may follow. - Calcium malabsorption in osteoporosis, bone fragility and spontaneous bone fracture. Calcium is absorbed throughout the length of the small intestine, but like other nutrients, more avidly in the proximal section, the most damaged part of the intestine in malabsorption. Other factors than calcium may be involved in bone lesions caused by malabsorption, such as a vitamin D deficiency and a shortage of boron possibly caused by the same malabsorption. Osteomalacia (l) develops in patients with years of relatively mild malabsorption. - In fat malabsorption a deficiency of fat soluble vitamins (A,E,D) is frequent. 5 - Examine under microscope. Stool of normal individuals display only a few small droplets. Accuracy : The Sudan stain test detects 80 to 90% of fat malabsorption.